A Picture Tells A Thousand Charts. 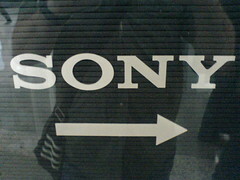 This picture [a sign pointing to reception] demonstrates what we feel is one of the core problems with the SONY brand. In short, too many people and too much time has been spent looking sideways rather than forwards – resulting in certain left-field competitors [like Microsoft, Apple, LG and Samsung] not only catching up, but in some categories, taking over! Don’t get me wrong, SONY are still one of the great, global brands … but the task we have been given is to help them stand up and be counted again. This makes me very happy as I love SONY – but the reason for this post is that one of their key marketing people said something very interesting – something that explains the divide in riches between advertising and management consultants. What they said was that our ‘single picture strategy’ was wonderful because it embodied all the issues they were facing and helped them understand what they had to do both internally and externally to get the brand energy back. The problem was that it was almost too simple. Because everything had been wrapped up into a single picture [rather than via a 1000 page PowerPoint presentation] their first impression was that it’s ‘corporate value’ was less than that of say, a Management Consultant report – featuring pages and pages and pages of financial, manufacturing and process models. To be fair, SONY have got over their ‘issue’ and have been incredibly supportive. Sure, we’ve had to do a few ‘formal presentations’ explaining how we’re going to help them get their ‘mojo’ back, but overall, they have welcomed our ‘to the point’ approach … however what is interesting is that in the big business World, consultative value seems to be directly related to the ‘volume’ of work produced rather than the ‘quality’ – and when a planners job is ultimately about the ‘simplification of issues’ and the ‘motivation of people’, is it any wonder the money we command is dramatically less than that of our Management Consultant cousins? Don’t get me wrong, the ad industry has a hell of a lot to sort out about itself … but I really believe big business has a duty to educate [and support] it’s people in appreciating, understanding and trusting the value of ‘insight’ – because if they don’t, everyone could ultimately lose out. To those of you out there that think the ‘Sunday Sport’ is the most un-newsworthy newspaper in the World … check out this front page from a Singaporean paper. According to UPS on any given day they have two percent of the world’s GDP in the back of their UPS delivery trucks and/or cars! Now if we assume DHL and FedEx can claim similar figures, that means upto 6% of the World’s GDP is handled by 3 companies every-single-day. Can you imagine what would happen if they all decided to go on strike at the same time? Not only would it affect the global economy, but for certain countries it would probably cause more damage than any war or act of terrorism. This begs the question: If this situation occurred, would Bush invade these organisations because they represented a serious threat to America and the World? To have that level of power in the hands of just 3 companies [or should I say, in the hands of the Unions that represent the people of those companies] is amazing – and is surely the perfect storyline for the next superhero flick. Common Sense Does [Sometimes] Prevail! 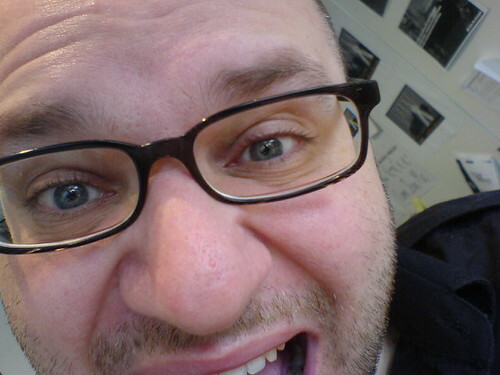 Ages ago I ranted about a pitch I’d done against a mate of mine and how I was convinced the client would choose his campaign because it was exactly what they wanted to ‘hear’ … whereas we had gone with what we believed was the best way to achieve their business goal by really understanding consumer needs and wants. Can you remember it? If you can’t, go here for a quick ‘re-cap’. Anyway, whatcha know … we won! So yes, I am eating my words – but after the trials of yesterday, I think I deserve it! There are moments in my job where I just ask what the hell am I doing! For the last few days I have been at a massive conference for one of our biggest clients. It was a chance to meet, greet and take people through the masses of work we’re doing for them. Within a nano-second it dawned on me … they had no idea we had been given the ‘green light’ to proceed with one of the biggest changes in their company of the past 10 years. I honestly was lost for words for a few seconds but my client [another of the key CEO’s] jumped in and proceeded to explain what he had asked us to do. There then followed 90 minutes of pandemonium [with us being asked to leave the room as they don’t have these ‘discussions’ infront of agency people] where at the end of it, we were told they love what we have done for them but they had some more ‘thinking to do’ before they could tell us how to proceed. I wouldn’t mind except we’ve gone and spent a fortune making a bunch of ads!!!! Thank god they signed the estimates, haha! I find it amazing many people think advertising folk don’t understand business when the so called ‘experts’ let shambles like this happen. Oh well … guess it keeps life interesting. Talking of that … I got sent this awful, awful, awful DM campaign from skincare company, Imedeen. What on earth were they thinking? It’s about as subtle as a cucumber down a pair of cycle shorts!! And contrary to what you may think … it wasn’t ‘approved’ by a sad, sexist bloke who gets his sexual kicks from this sort of rubbish … it was a new-Mum that said ‘Yes’ to this crap. I don’t know if they are trying to be young, cheeky or mischievous – but whatever they are, they are suffering from an alarming lack of judgement. The thing that especially annoys me, is that if this was for a male product, they’d be universal outrage about it – but because it’s for a female brand, people will just put it down to ‘bad taste’. It’s a crazy, mixed-up World and I thank God it’s Friday – it’s all been too much for me this week, ha!! Singapore is gearing up for the annual meetings of the International Monetary Fund and World Bank. Prime minister, Lee Hsien Loong, has led a ‘Four Million Smiles‘ advertising campaign – advising the poor locals to grin at those arriving for the event. Yes, I’m being serious, you have to be happy – by law! As the entry below shows, they are a special breed altogether sooooooo, to keep up the ‘illusion’ of Singapore being a peaceful, polite, morally clean city/country … they have been given special training to improve their manners. Wonder how long that lasts eh!? Then, in an act of absolute naivety, the head of the local police has reminded people that Singapore laws state any outdoor demonstration by more than four people requires a police permit – so he is not expecting any trouble over the event. Sure mate … you have nothing to worry about, the people against the IMF are known for being law-abiding citizens aren’t they. The only reason they’ll be no trouble at the IMF event is because even if thousands of protestors do make it all the way over here – they’ll probably have a brain aneurism within the first 2 days because they won’t be able to comprehend how a whole nation can be obsessed with one goal … shopping … and how they’ve got more shopping centres per capita than anywhere on Earth, to do it! It’ll probably throw their body into wild convulsions … get them frothing at the mouth … and even if by some miracle that doesn’t get ’em, one look at the standard of ads around the place, will. Don’t get me wrong, I like Singapore … but I just wish they’d be honest and admit it is not a ‘free’ society, but a dictatorship. I am a guest in this country, not a citizen. … but my concern is this patriarchal control is setting up Singapore [especially the youth] for a major fall sometime in the future – because too many people don’t believe they have to ‘think’, they simply have to ‘do’. And if the country really wants to achieve even greater heights, then it needs to ‘let go’ a little bit and encourage the talent that lives within the country to explore, learn and develop on their own terms – because if they don’t, they could get left further and further behind because they won’t know how to cope with the World’s constantly changing dynamics. 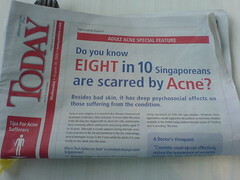 Guess it goes back to my earlier entry about Singapore’s value of art versus business eh? Also guess this will get me kicked out the place, ha! The Most Dangerous Taxi Driver In The World? Taxi drivers in Asia are ‘interesting’ to say the least. In a really twisted way, these are some of the reasons I really love Asia.